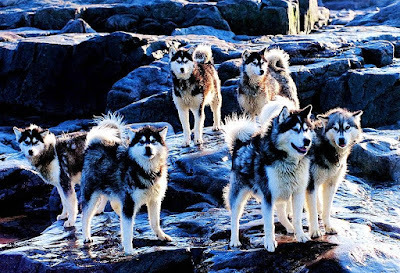 i think i want some sled dogs! my new calling! 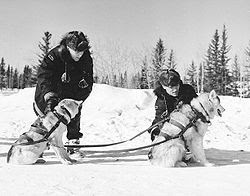 But in my prelim research this AM I came across this little tidbit: "In 2004, Doug Swingley, a four-time Iditarod winner, pulled out of the race with frostbitten corneas after taking off his goggles to see the trail when the wind chill was 90 below zero." So I reconsider.. Put that back pack on Nea and walk her down to the pier...Voila! Just reading the words 'frostbitten corneas' makes my eyes hurt. EVERYONE knows you don't take off your goggles with a -90 windchill. Jackass. just have your corneas removed before the race. problem solved. dude, wut? shitz fuct up. Um. Yeah. I'll pass on the frostbitten corneas. Or anything else for that matter. guy never heard of spare corneas? amateur. Frostbitten aything is a total turnoff for me, so no dog sled racing. But I would take any of those dogs.